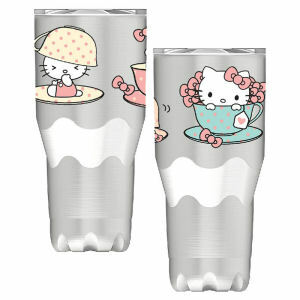 Be sure to get your Hello Kitty 30 Ounce Stainless Steel Travel Mug hot of the truck! Fill in the Notify me when Available and you will be the first on your block to have a Hello Kitty 30 Ounce Stainless Steel Travel Mug !! From the Hello Kitty collection by Vandor. Hello Kitty 30 Ounce Stainless Steel Travel Mug. Hot beverages that stay hot for over 4 hours and cold drinks that stay cold for about 40 hours. The BPA-free Tritan lid slides securely closed to reduce spills and can be used with a straw. The double-walled ergonomic design prevents condensation. Vandor Hello Kitty Coffee Mugs shipping from Canada. No Surprise Border fees or Customs!